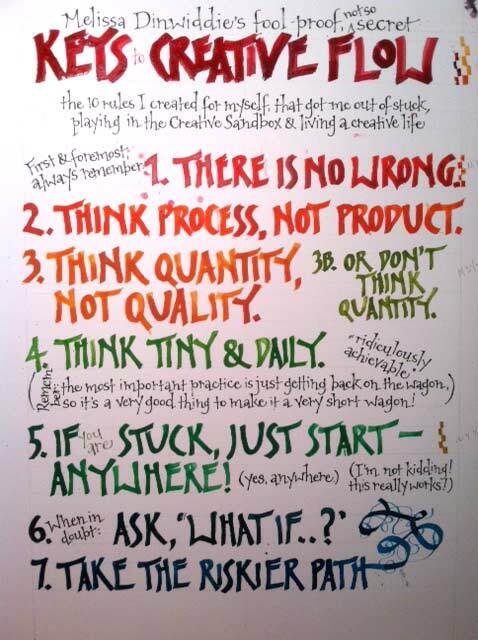 On Tuesday after Thanksgiving, the doors opened to Creative Sandbox 101, the five-day mini-course I designed based on my Rules for the Creative Sandbox. Over the course of the next several days, I watched as hundreds of people registered for the course, and lives began to change. Seriously, the comments people have left inside the Creative Sandbox 101 “classroom” have not just floored me, they’ve brought tears to my eyes! 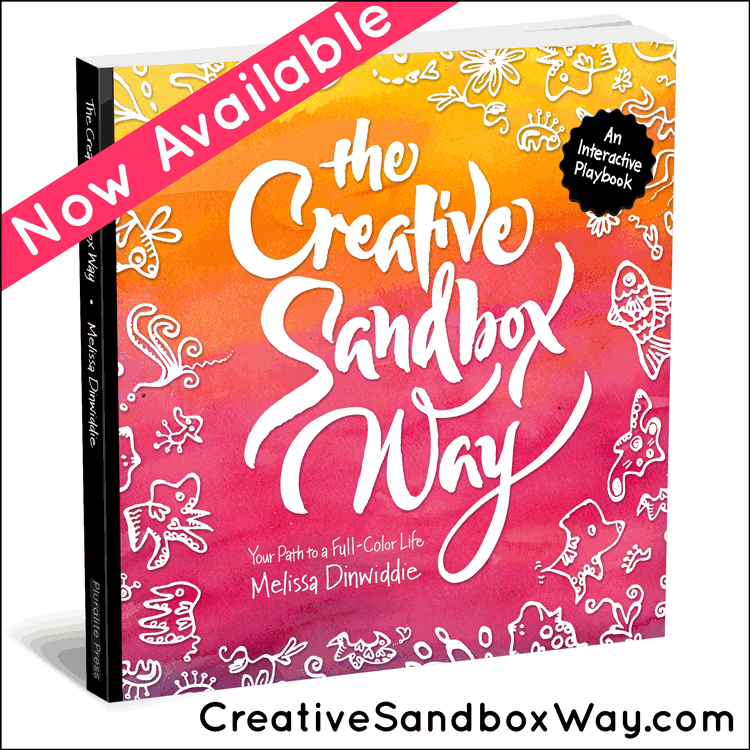 I honestly didn’t know what to expect when I signed up for Melissa’s Kick-Start course but the idea of a “Creative Sandbox” just grabbed me. From the first day I just started having a ton of fun and immediately realized that I had a lovely playful self inside of me that I really only engage when I’m “doing something” in which being playful “makes sense” as part of another goal. 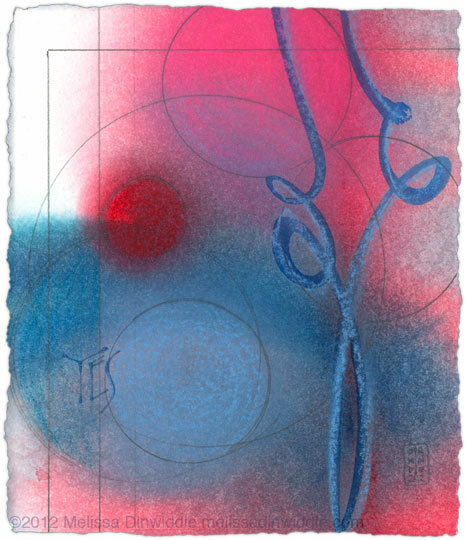 The BIGGEST surprise, though, was how this process helped me reconnect with Playful Erin. I cried on the last day when I realized how long I have kept her stuffed away. The joyful part is that I’m now letting her out and I am NOT going to shove her back in the box ever again. Everybody has the wounded child living within them, this class helps to heal those wounds and coax that child to come out and play: playing by creating is good for the soul. 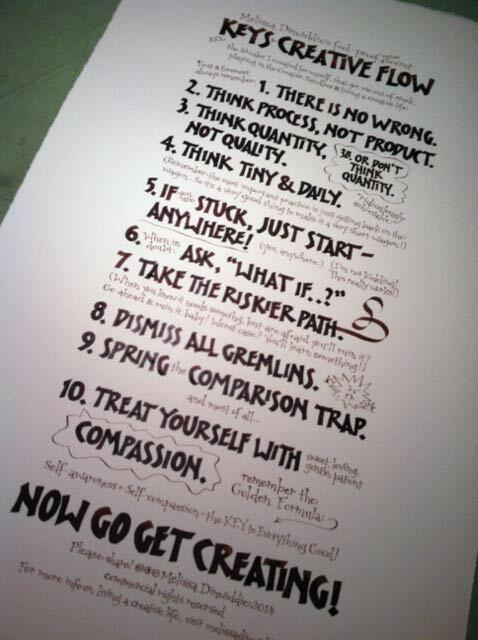 I read Melissa’s 10 Rules on her blog and heard about them in an interview. 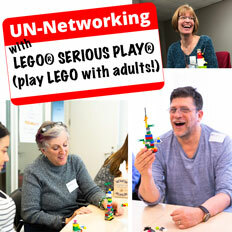 I thought they were great ideas and even shared the links with friends, but this course invited me to EXPERIENCE them. 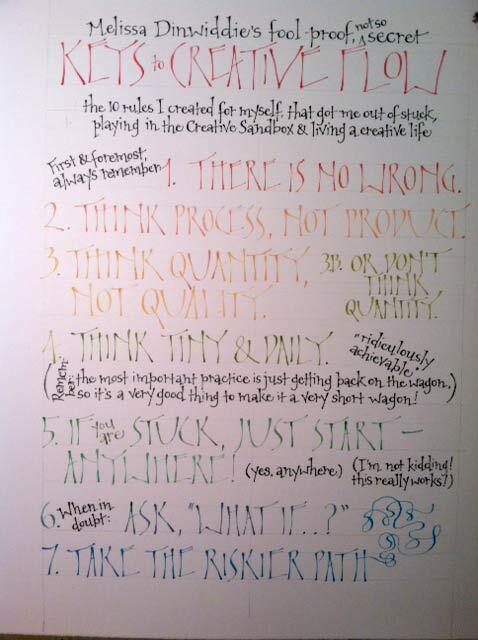 I have a new excitement about and commitment to my creative life. Thanks, Melissa! 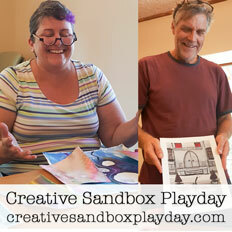 Creative Sandbox 101 really opened me up to realizing that creativity is NOT about being perfect or even the end result-it is about the BEING and DOING of expression, playfulness, fun and experimentation! They go on. And on. This. THIS. This is exactly what I was hoping for. This is exactly in alignment with my mission to empower people to go after their creative callings. Even when they don’t think they can. Even when they think it’s frivolous and stupid. Even when they are convinced they don’t have time. Even when gremlin voices in their head come up with seven thousand and one other reasons why they shouldn’t or can’t or don’t deserve to. Big change often comes about tiny baby steps at a time. If even one person got benefit from Creative Sandbox 101, that would have been worth it to me. But it has been more than one. It’s been enough to qualify as a small movement. Tiny, but hopefully growing. 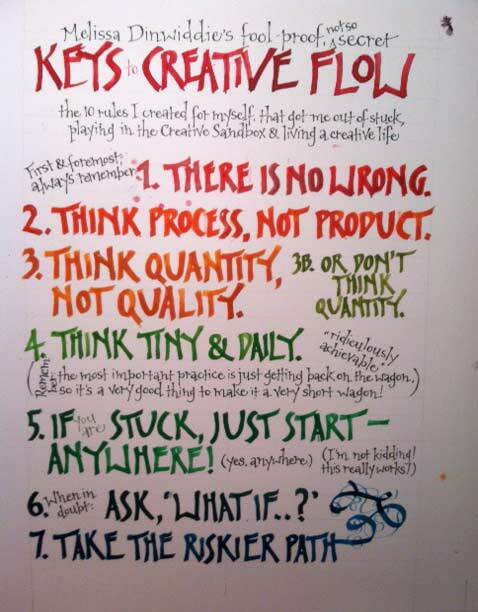 Not everyone who went through Creative Sandbox 101 will keep up with their daily creating. Many I’ll probably never hear from again. But some will carry forth the insights they’ve gleaned, and the world will change. Their individual lives will change in small or large ways, and that change will ripple out to affect everyone they come in contact with. This is how movements start. Like any other important thing, a movement doesn’t happen overnight. It grows little by little, baby step by baby step. 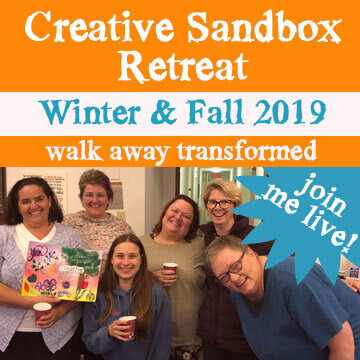 If you missed registering for Creative Sandbox 101, I may bring a revised version of it out again down the road — click here to get on the waiting list. In the meantime, I thought I’d share a small piece of the course here. This is a video I made very spontaneously on the third day after Creative Sandbox 101 opened for registration. I noticed a lot of very nasty Comparison Trap gremlins floating about, and wanted to deal with them right quick. I wasn’t actually intending to post this outside of the course — I was sticky with sweat, my hair was dirty, and this video was really off-the-cuff. It felt kinda vulnerable to post it inside the “classroom,” and even more so outside of it, where anyone might see it. But I got a lot of positive response to this video. It made a difference for a number of people, and keeping it locked up just because I felt a little vulnerable just seemed silly, if it might make a difference for someone else. Enjoy. And then go get creating! 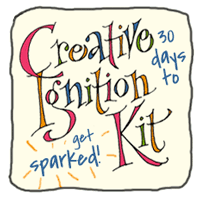 Whether or not you got a chance to check out Creative Sandbox 101, you might want to check out my Creative Ignition Kit, a 30-day course to build the consistent, sustainable creative practice you long for. Read all about it here.